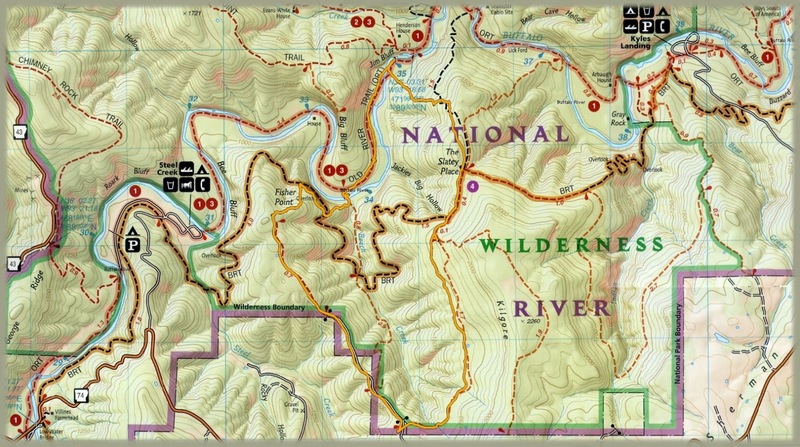 Interest in the Ponca Wilderness has me back there again. 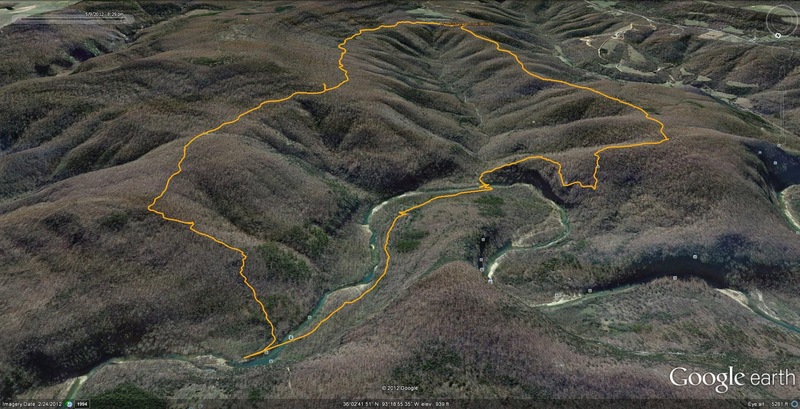 Arrival at the starting point was made at 4:30 p.m. Wednesday afternoon at the end of a CR 143/140 that runs north from Low Gap off highway 74. The road ended at a gate at the border but continued for a ways until it shrank to a trail just past a house under construction. As I came near Fisher Point the sound of strange animals all around me caught my attention. The realization that a horde of wild hogs was encircling me was a new one on me. Hogs have never been encountered before in all my backwoods hikes. They were snorting and grunting like a scene from Planet of the Apes. I grabbed a hefty staff and prepared for their onslaught...but not before letting out a loud growl of my own...which seemed to disperse them...for as I walked on down the slope all was quiet again. This was a fine sunny day with low humidity and a temp in the upper 70's. There was an exposed bluff that was seen on my last like from Big Bluff on this side of the river...this was my destination for the night. The map showed there to be an overlook in this very area that was assumed to be this bluff. I hit the Buffalo River Trail and followed it east until an opening in the trees revealed an overlook....but not the one I had hoped to find. 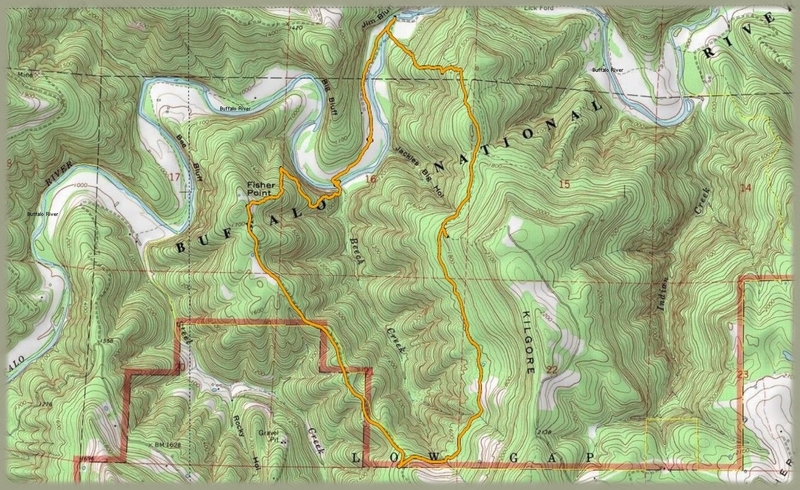 Continuing on the river was attained and crossed twice until Jim Bluff was in sight. Trash on the gravel bar and the horsey trail that was followed to get here had given me second thoughts about this hike. I ate some food and headed up the hill to find another trail that would loop me back to my origin. I hate to wimp out on hikes but my desire to go on was lost. Made it back by 8:30 and drove to Jasper. Only 3 ticks achieved penetration. Total mileage about 7.5. I never did get any photos either. Oh well...until next time. After grabbing some grub in Jasper I slept for a couple of hours at Turner Bend then headed south at 2:00 a.m. I ended up at Jack Creek Recreation Area that morning. Some time was spent exploring this area and Sugar Creek then I headed to the Talimina Scenic Drive on top of Rich Mountain. After that a stop for dinner and a beer on the Cossatot River for the sunset was in order. This was a great day of casual exploration to many familiar locations.